The staff of the Great Lakes & St. Lawrence Cities Initiative wishes you all the best for the coming year! 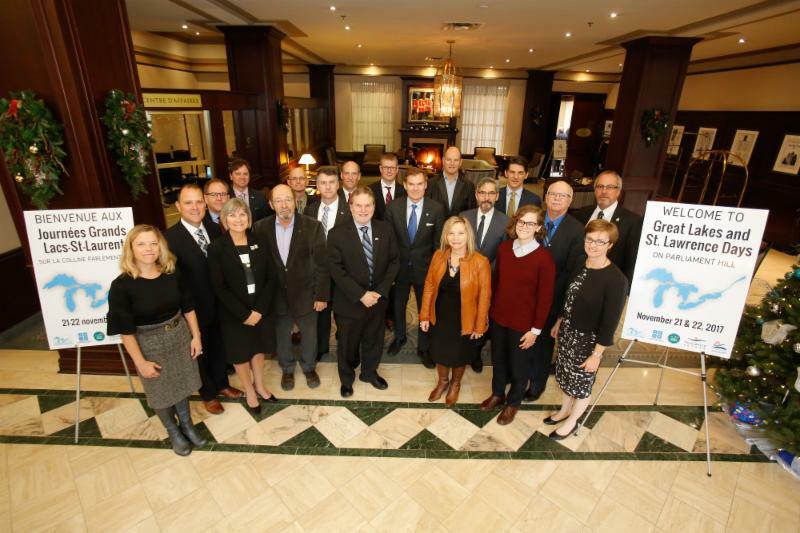 At the end of November, the Great Lakes and St. Lawrence Cities Initiative held the second annual Great Lakes-St. Lawrence Days in Ottawa along with partnering organizations the Council of the Great Lakes Region, the Great Lakes Fishery Commission, Freshwater Future, and Stratégies Saint-Laurent. Over twenty individuals representing municipalities, businesses, environmental NGOs, and fisheries attended and met with over a dozen officials from the Canadian Government, including Members of Parliament, Senators, Ministry officials, and the Minister of Environment and Climate Change, Catherine McKenna. 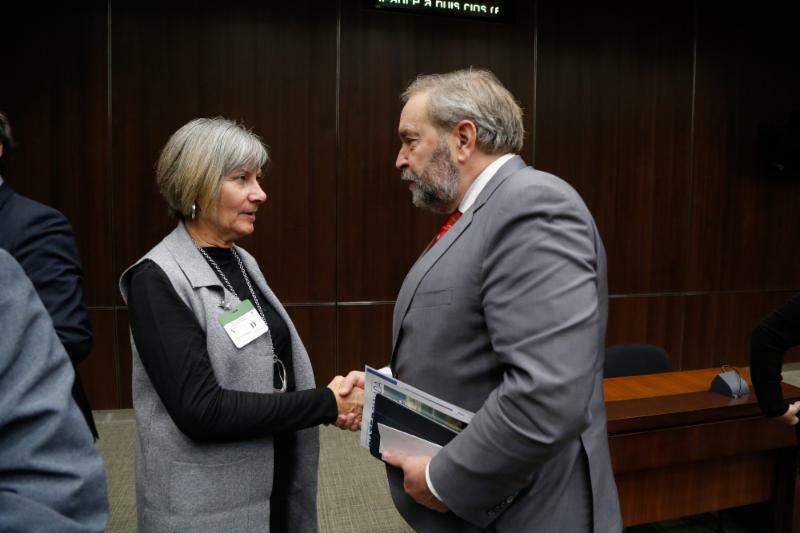 The delegation advocated for an inclusive, stakeholder-led process, called the Collaborative Strategy, to amplify and accelerate actions and investments to protect and restore the Great Lakes and St. Lawrence. For more information, including the proposal for the Great Lakes-St. Lawrence Collaborative Strategy, please visit https://glslcities.org/initiatives/collaborative/ . 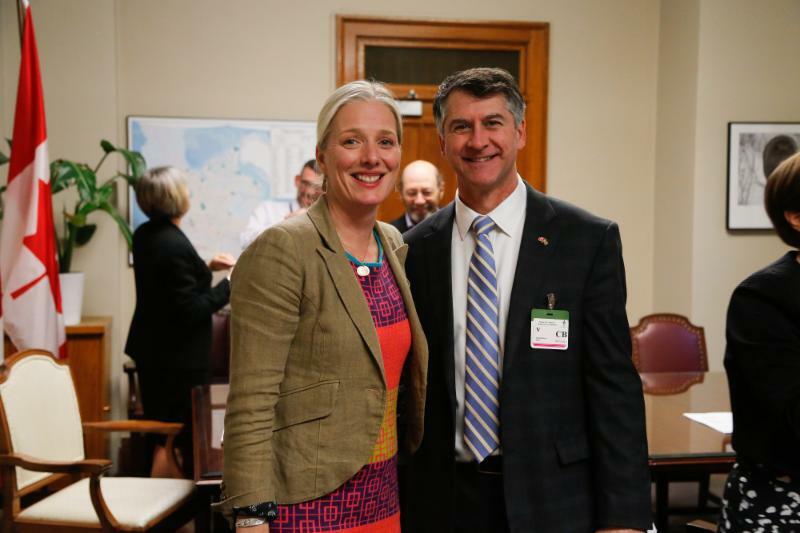 Following Great Lakes-St. Lawrence Days, 24 Members of Congress from the United States from the Great Lakes Task Force wrote Minister Catherine McKenna to encourage her consideration of the proposed Great Lakes-St. Lawrence Collaborative Strategy. Inspired by the Great Lakes Restoration Initiative in the US, the Collaborative Strategy aims to strengthen bi-national efforts for the Great Lakes and St. Lawrence. To read the full letter, visit https://glslcities.org/wp-content/uploads/2018/01/2018-01-03-Canada-GLRI-Letter.pdf . The Board of Directors convened in Toronto, Ontario on December 11 -12, 2017 for the midyear Board of Directors meeting. The two days kicked off with a strategic planning session led by consultant Bina Patel. This strategy session tackled big picture questions around the organization’s purpose and impact. The board’s input from the meeting will be combined with input from staff and sent to the membership for feedback. Day two focused solely on business of the organization, including some in-depth discussions around Asian carp, nutrient pollution, and climate change. We were fortunate to be joined briefly by the new Regional Director of the North Americas for the C40 Cities, David Miller (former mayor of Toronto and founding Cities Initiative director). 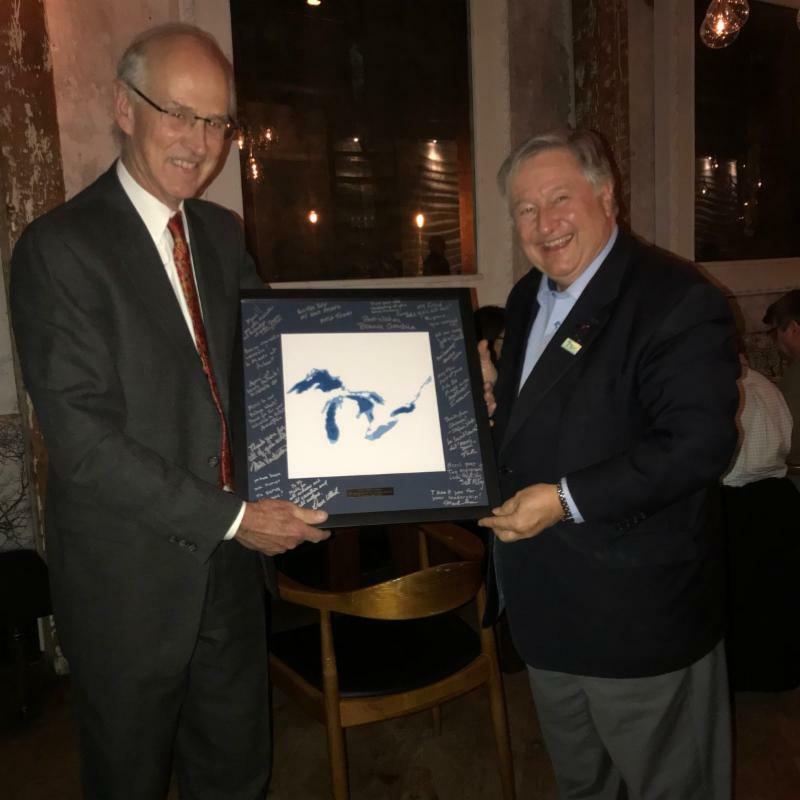 At the midyear meeting, we recognized former mayor of Salaberry-de-Valleyfield and a founding director of the organization, Denis Lapointe, for his commitment to the Great Lakes and St. Lawrence and the organization. We also recognized staff member Simon Belisle for all his hard work for the organization over the last six years, and bid him good luck with his new job at the Great Lakes Protection Fund. The Cities Initiative submitted comments to the US Army Corps of Engineers regarding the Great Lakes and Mississippi River Interbasin Study – Brandon Road Draft Integrated Feasibility Study and Environmental Impact Statement . The Cities Initiative encourages that the Tentatively Selected Plan, the alternative that the US ACE determined reduces the risk of aquatic invasive species transfer to the maximum extent possible while minimizing impacts to waterway uses and users, be implemented immediately. To read our full comments, visit https://glslcities.org/wp-content/uploads/2018/01/GLSLCI-Brandon-Road-Comments.pdf . In its First Triennial Assessment of Progress under the 2012 Great Lakes Water Quality Agreement (Agreement), the International Joint Commission (IJC) calls on Canada and the United States to set specific timelines and targets for making critical improvements to wastewater and drinking water infrastructure, reducing nutrient runoff and eliminating releases of chemicals of mutual concern. The Mayors Innovation Project is a learning network for American mayors. Topics to be discussed at the meeting include: Expanding Access to Voting; Building Immigrant Friendly Cities; Building Equitable Bike Infrastructure; and Fostering Healthy Discourse in Your City. For decades, the Waterfront Center has been in the forefront of the struggle to ensure that waterfronts are carefully planned, balancing the need for private investment with the absolute mandate that the public is entitled to full and unfettered access to the water. This conference addresses the challenges waterfronts face in the 21st Century through its two tracks. Webinar on implementing a municipal stormwater fee and how to increase participation in incentive and credit programs, featuring the case study of the Town of Newmarket, Ontario.